Owning a sports car is a tempting idea – and once upon a time it was one available to the young, limber and care-free. The modern era of £3,000-plus insurance quotes for 21-year-olds driving bog standard hatchbacks means those days are long gone. Nowadays, those fulfilling the sports car dream are more likely to fit into the ‘middle-aged and made it’ bracket. They’d like to treat themselves, but when it comes to actually owning a car they don’t quite want the classic small, raw and lightweight experience. Small means feeling vulnerable on the motorway, raw spells bad news for your back, and adding lightness involves removing creature comforts. That’s why I always feel that grumbles the Jaguar F-Type is a bit too big and heavy to be a true sports car miss the point. Jaguar knows what most of its customers want and that’s a combination of sportiness and comfort that veers closer to what’s traditionally been known as a grand tourer, rather than a small classic British sports car. Call it what you want, it doesn’t really matter, because climb into an open top F-Type and it delivers what most people want from a sports car. 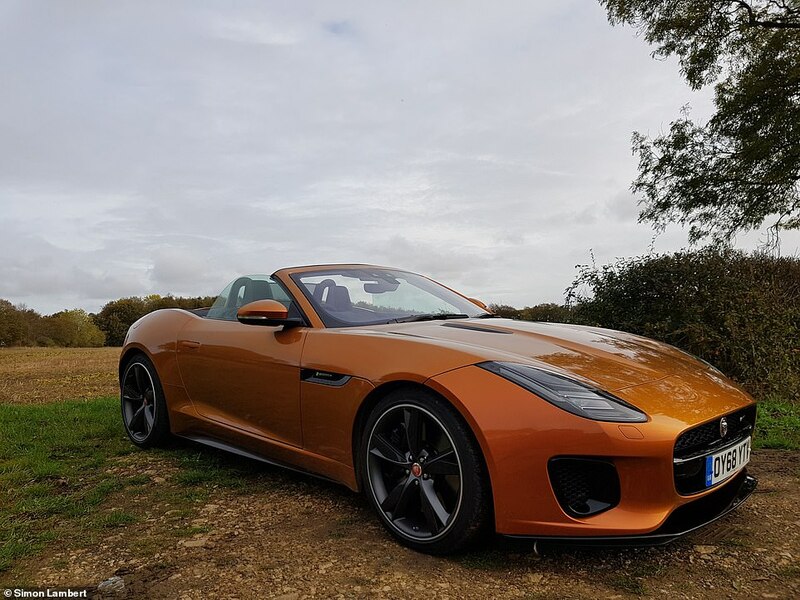 Piloting the F-Type around winding Cotswolds country roads it certainly didn’t feel big and on a chilly day with the sun just about poking through the clouds, I was glad of the creature comforts on offer. Yes, you probably look like an intolerable poser driving about with the roof down at such a time of year, but it is fun. 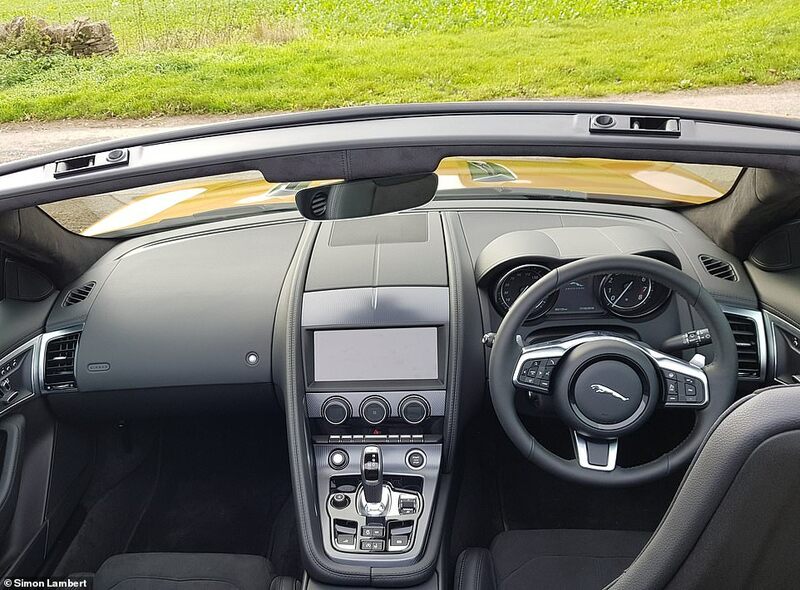 Heated seats on, heater switched up and cosseted from the wind by the deflector that rises from behind the front seats, you could see how F-Type owners can get decent use from their convertibles even outside of the summer months. The F-Type arrived on our roads some five years ago in convertible form, swiftly followed a year later by a coupe version. Both are among the prettiest cars on the road, with near perfect proportions that have an unmistakeable Jaguar style without resorting to any retro-aping of models of yesteryear. 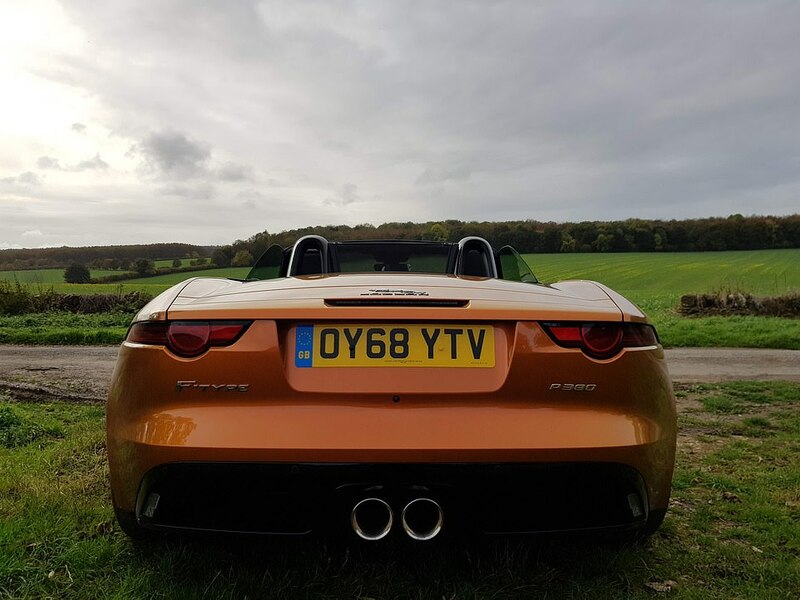 The F-Type is fast and handles well, with a range of engines that step up from a four-cylinder 2.0 litre engine, through 3.0 litre V6s, to 5.0 litre V8s in R and full-on bonkers SVR format, with a 200mph top speed. Jaguar has always been a manufacturer that likes to stick with a winning formula, as evidenced by the longevity of its models, such as the XJ, XJS and the F-Type’s predecessor the XK. So while at the grand old age of five, the F-Type has been given a 2019 model year update, there are no dramatic changes going on. The cars look pretty much identical to their predecessors – which is no bad thing – but come with some handling, tech and trim updates. The F-Type range is also now designated by power rather than engine, using PS (pferdestärke, the metric measurement which is 98.6 per cent of horsepower and thus virtually interchangeable with bhp). So we get the P300, P340 and P380, instead of the former 2.0 litre turbocharged, V6 and V6s, respectively. The R and SVR badges for the top-powered cars remain, with these putting out 550PS and 575PS. Prices start at £51,925 for the four-cylinder car, as the P300 coupe, or £57,405 for the same engine in a convertible. Most are rear wheel drive, but all-wheel drive is an option on more powerful models. 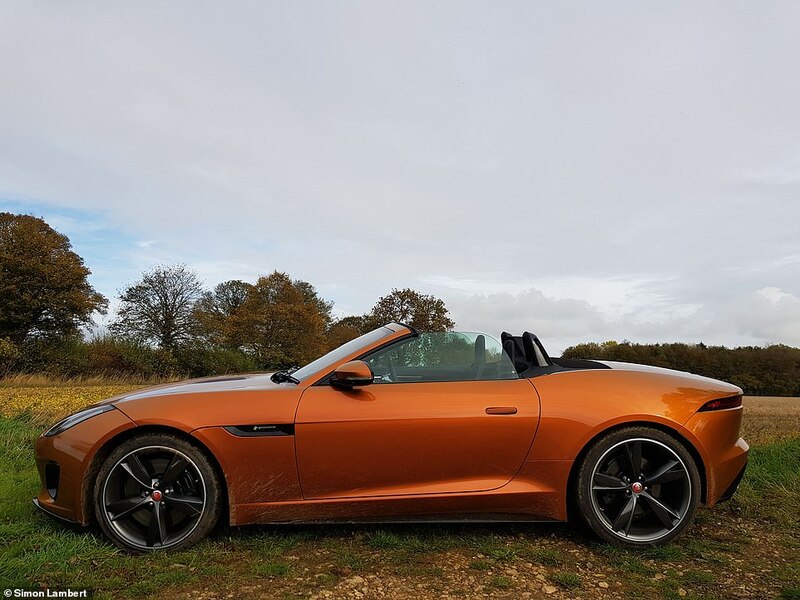 I tested both the four-cylinder 2.0 litre P300 engine specification and the higher-powered 3.0 litre P380 V6 format in the F-Type convertible. ‘Brake for the corner, keep some power on, accelerate to get it to slide, once you feel it move ease up a bit, turn into the skid and then accelerate hard’. 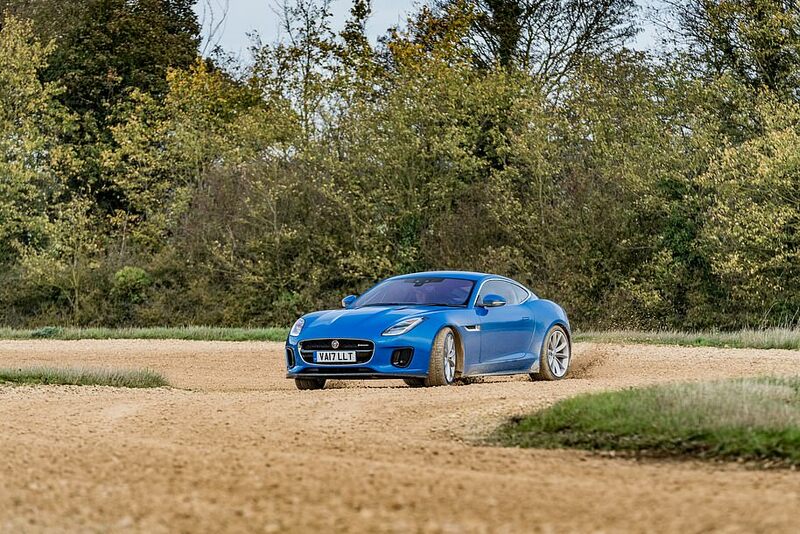 Those were the instructions as I took the sweeping gravel corner on the Grand Tour track in the show’s stripped out and roll-caged Jaguar F-Type, now retired from duty. Or at least I think they were, I was a bit too busy to remember, as my schoolboy attempt at drifting a Jaguar sports car turned into a pirouette that ended up with us facing the wrong way on the grass. My instructor Sarah Reader laughed and told me I was getting better. It didn’t feel like it, but off we went again, round the tarmac and dirt track that Jeremy Clarkson and Co. sent celebrities round on the last series of the Grand Tour. 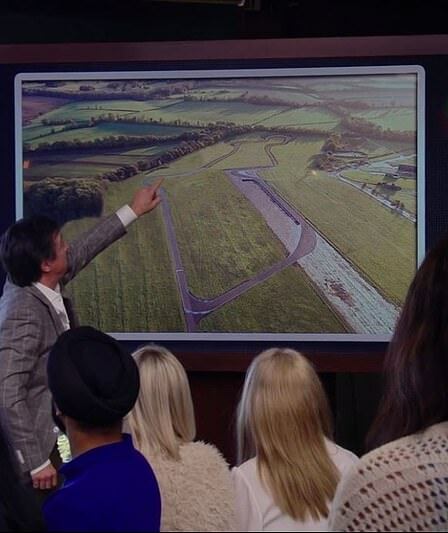 If you’ve ever watched the celebrities go round the track on the Grand Tour or Top Gear and thought that looks easy, trust me it isn’t. In this case, the transfer from tarmac to gravel and back again adds a whole extra level of complexity to getting round. 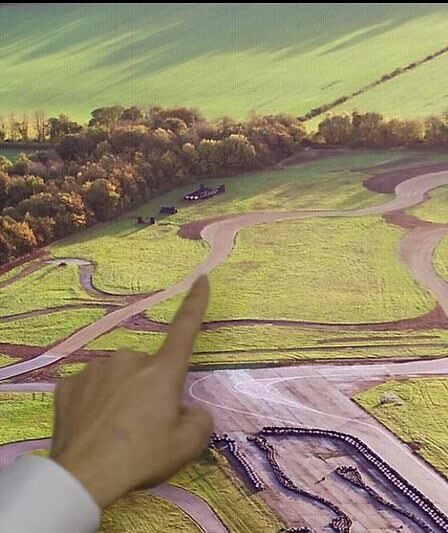 Anyone who’s ever been round a track with an instructor trying to get them to go quicker on the fast bits and lose speed better on the slow bits, while taking the right line through the corners, will also appreciate that trying to drift round gravel bends doesn’t make life any easier. Nonetheless, it was immense fun. Sadly, I didn’t get any times to measure myself against the big names that the Grand Tour team pitted against each other in their second series of the Amazon Prime show – and nor will I get the chance to watch any new ones tackle this course. The third series of the Grand Tour, which has just started, has canned the section. My trip round it late last autumn might have been one of the last. Climb into the F-Type and it instantly feels like you are sitting somewhere special. Sitting in the low-slung seat, the car has the feeling of wrapping around you. That long Jaguar bonnet stretches out in front and the door line rises up to close you in. 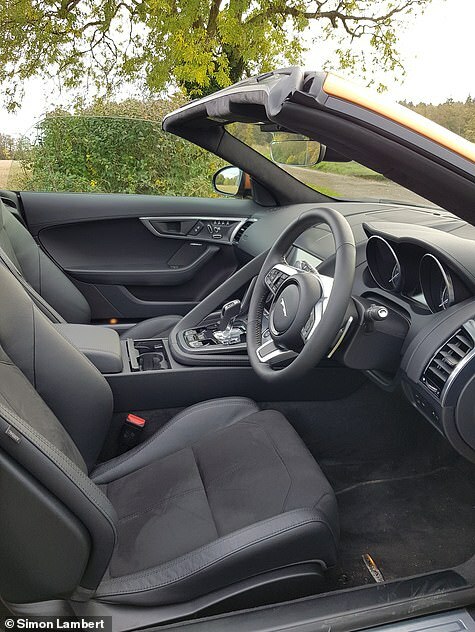 There is plenty of space, considerably more than in a smaller sportscar such as a Mazda MX5, and it’s less cosy than a Porsche Boxster or Cayman. Deep set circular dials for speed and revs are mounted either side of a digital display in front of the driver and the central console is refreshingly unfussy. A gearstick for manning the autobox sits centrally – rather than the circular controller found in Jaguar’s saloons – below that sit four buttons for functions including traction control and the active exhaust, which accentuates the engine sound. In the convertible, these are joined by buttons for the handbrake and roof. 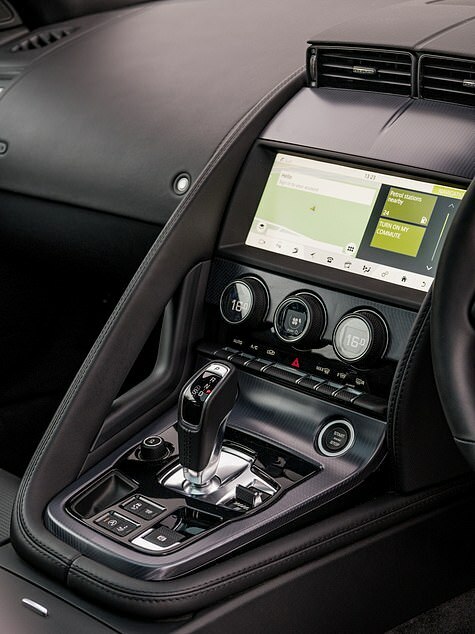 Modern day cars can be baffling to operate with their array of buttons – sometimes feeling haphazardly placed – but the F-Type passes the simple and intuitive test. In the centre you also find an on/off button for the stereo and a switch for the driving modes. Rising up towards the improved 10 inch Touch Pro touchscreen is the stop/start button, some toggle switches and the heating control dials. That may sound like a rather pedantic listing of buttons, but it’s refreshing to be able to get in a brand new car today and find the things you want easily. There’s a reasonable amount of space inside the F-Type to stash stuff but this is a car for travelling relatively light. Nonetheless, there is plenty of room for both driver and passenger and the well-trimmed interior and comfortable Alcantara sports seats, would easily soak up a long journey. 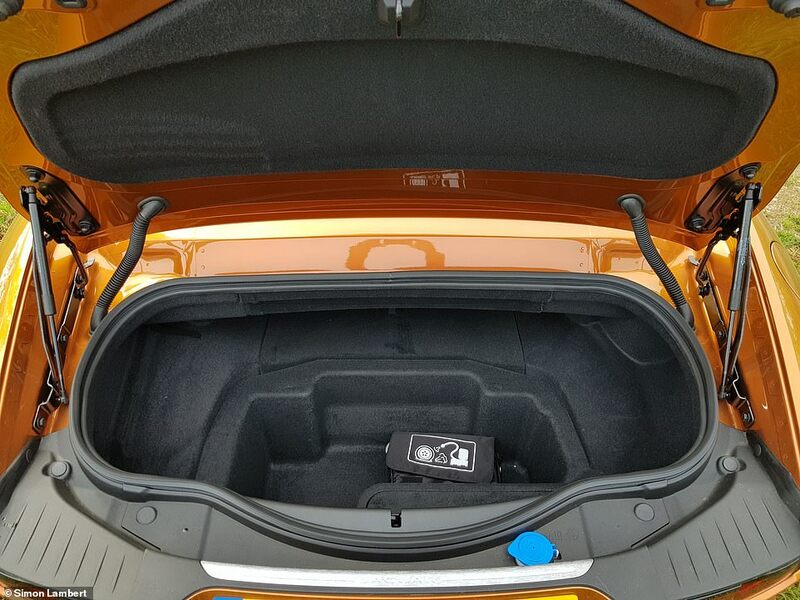 The boot will also swallow a set of golf clubs; and although I had none to hand a quick search will find you YouTube videos of people proving that the F-Type passes this quintessential middle-class test for a Jag. Fire up the engine, gently pull off into slow moving traffic and the F-Type is an easy car to drive. It’s docile at town speeds and easy to potter about it in, with decent visibility. But, obviously, it’s when you get away from everyone else and onto national speed limit roads that the F-Type really comes into its own. Bury the accelerator and you are propelled forward with serious urgency. Flick the automatic gear lever over to sport mode and it dials things up a bit, holding on to the revs a bit longer and making things feel a bit sharper with a more rewarding driver experience. You can opt to use the paddle shifters on the steering wheel to change gear, but unless you’re doing that for fun it’s unnecessary, as the eight-speed automatic gearbox does a fine job of choosing the ratios. A centre-mounted switch will also stiffen up the suspension to improve handling in dynamic mode, while the option of configurable dynamic mode is also on offer, but normal driving mode in the F-Type – as it is with almost all modern-day Jaguars – is absolutely fine. In R-Dynamic specification, as the P380 that I drove was, you also get adaptive dynamics and a limited slip differential with torque vectoring, to further improve handling and keep power and cornering in check. 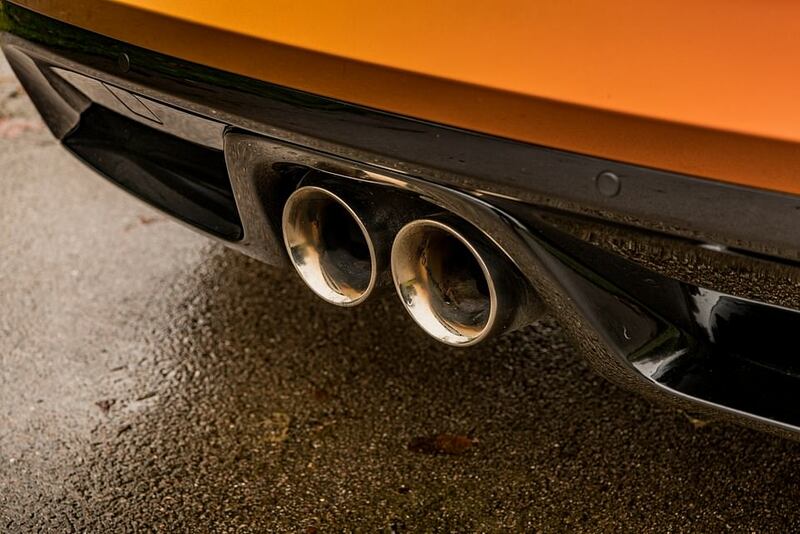 There’s also a switchable active sports exhaust, if you fancy enjoying the F-Type’s roar on demand. On a sweeping A-road, the Jaguar is in its element. 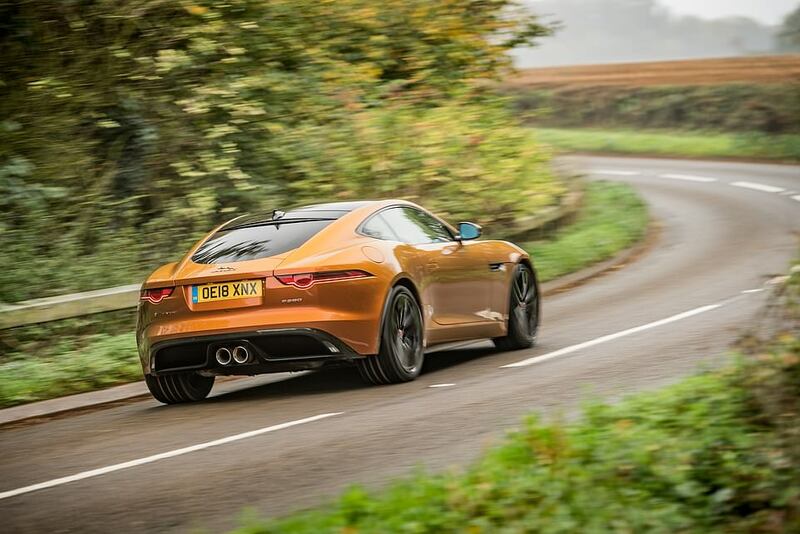 Its balance is ideally suited to big bends, the brakes shed pace nicely, the weight shifts sweetly, and the F-Type effortlessly adds speed back on. 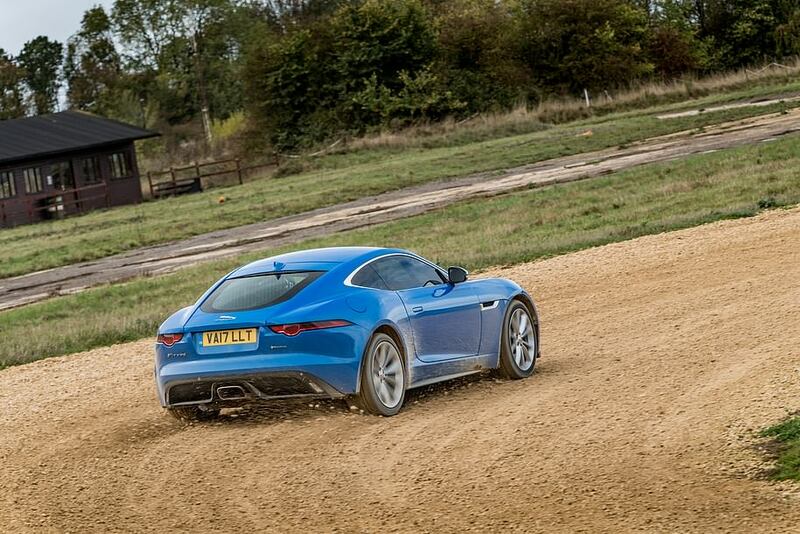 But plot a course down a twisty B-road and the F-Type shines too. You can feel a good sense of movement from the car and easily get into a motoring rhythm that puts a smile on your face. It’s a modern car, so it’s fairly wide but, as mentioned above, at no point did I think the F-Type felt too cumbersome round windy Cotswolds roads. Of the two F-Types that I drove, the supercharged V6 P380 was the sweeter engine. Smooth, sonorous and potent, it feels ideally suited to the car and sits nicely in the middle of the range. The four-cylinder P300 F-Type is the big seller though and buyers won’t feel short-changed, as its turbo-charged engine puts out plenty of power. The figures tell you that the four-cylinder car will do 0 to 60mph in 5.4 seconds and go onto 155mph, while the V6 P380 does the benchmark dash in 4.8 seconds and has a top speed of 171mph. Fuel efficiency and C02 emissions are a combined 31.1mpg and 179g/km and combined 26.2mpg and 223g/km, respectively for the four-cylinder F-Type and V6 P380. In fact, unless you really push it the P300 is not noticeably slower than P380 V6 and as it feels a bit lighter in the nose, the handling is very good. The four-cylinder engine does blare somewhat at town speeds, however. The only complaint on the F-Type’s ride comes in a slight bounciness from the stiff suspension on Britain’s less than adequate road surfaces, even in the most comfortable setting. Get the car onto dual carriageway or motorway, however, and it comfortably cruises along. The F-Type is comfortable and smooth enough to use as a daily driver, but has the looks and handling of a special car. It’s a car that you could easily take to the shops, but one that you’d also grab the keys to go drive just for the fun of it. Given the choice, I’d take a coupe version of the F-Type, as I think it edges the convertible on looks. 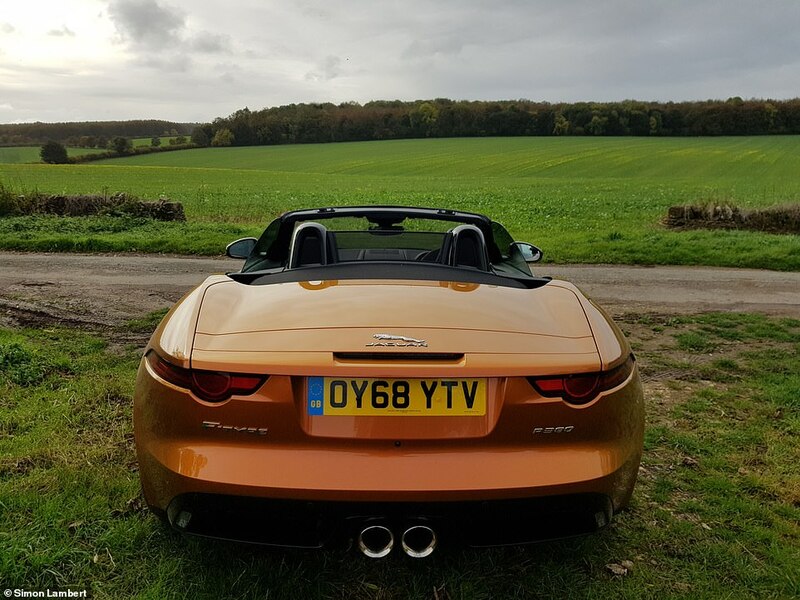 However, I could easily see why someone buying themselves a treat would buy the drop top – there is something special about open air motoring. And they’d be rewarded for the choice; roof down it’s a lot of fun and roof up it easily meets the standards of quietness and comfort that a modern-day luxury convertible buyer expects when they decided to shut the sky out. Jaguar already had a very good car in the F-Type and the updates for this refreshed version make it an even better one. 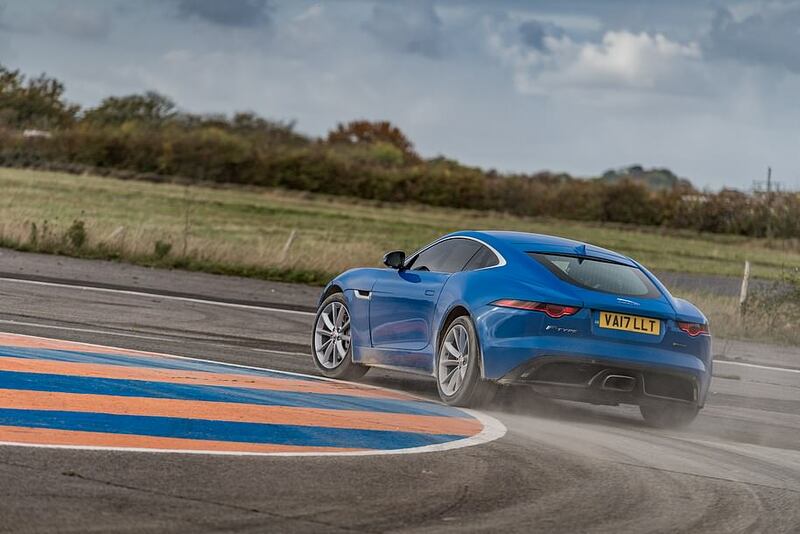 The problem for potential F-Type buyers isn’t the car itself though, it’s its rivals. The chief rival is Porsche. The broad price band of the F-Type, from the £50,000-odd four-cylinder cars, through the £72,000 V6 P380, and on to the £99,000 V8 R and £119,000 SVR, pits buying one against a Porsche Cayman and Boxster at the lower end and a Porsche 911 at the upper end. BMW, Audi and Mercedes will also happily sell you a powerful convertible or coupe with the comfort factor, with the Z4, TT and SL on offer. Meanwhile, if you buy the most powerful F-Types and get a bit handy with the options list you could even find yourself straying into Mercedes AMG-GT or Audi R8 territory. For those who want a rawer, more driver-focussed sports car, the Alpine A110 can also be thrown into the mix. That’s a pretty broad spectrum of cars and rather than the F-Type naturally falling into a spot on it, prospective buyers need to decide their price point and which one they want and then compare it to a rival. 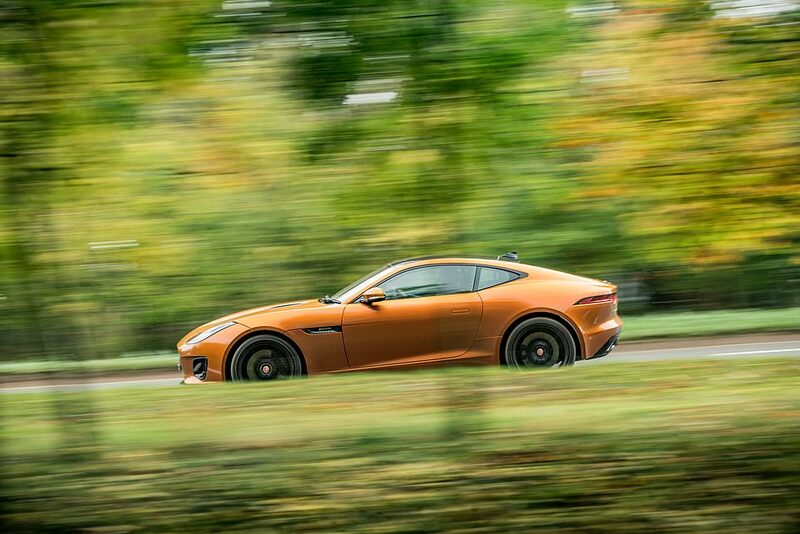 What they’ll get from the F-Type though is a Jaguar that looks fantastic and blends sports car and grand tourer to deliver a car that could be used every day but also has a sense of theatre and fun. And, of course, it comes with a British badge on the front.